You know those couples you meet that are on the same page regarding everything? They have such mutual respect, admiration and love for one another that you just know they are going to have a long lasting, prosperous marriage? Well, we were fortunate enough to work with a couple just like that- Sam & Marcy. These two just made our days brighter. Marcy is such a kind soul and goodness is she gorgeous! Sam, well, he’s pretty great too. We adore Hope Glen Farm- it is such a fantastic outdoor venue and provides a beautiful backdrop for a rustic inspired affair. Marcy and Sam’s soft pink and white color pallet was a great compliment to the venue’s natural charm. We asked Marcy to give us the scoop on why they selected Hope Glen Farm for their wedding day. She said “ We really wanted to have an outdoor wedding during the beautiful MN fall, especially at a rustic barn venue, such as Hope Glen Farm! Sam is from Arizona and I am from Missouri so it was really important to us to have a venue that could host both the ceremony and reception all in one place, for the convenience of all of our out of town friends and family. One of the many reasons we loved Hope Glen is because we wanted to pair our “southern roots” with some rustic and elegant charm, hence why it was the perfect place! As soon as we arrived we immediately said “ this is it”! It was truly the only place we could see and envision ourselves saying “I do” I truly think it’s just a feeling you get, you just know! Not to mention we were able to reserve our ideal September date because of a last minute cancellation that came in on the very same DAY we went to tour Hope Glen – so you could say it was definitely fate and totally meant to be! We love hearing stories like this because we absolutely believe that everything happens for a reason. Wedding planning should be memorable for all the right reasons, with lots of feel good stories too! Speaking of memorable, we also asked Marcy to share with us her favorite wedding day moment. She said “ I especially loved our dinner and reception time with our guests. We decided to go with a non-traditional “kissing toast” activity. We wanted our reception to be interactive and memorable, so we requested that our guests come up with a unique “kiss” that they would have to act out and then we would have to copy and imitate, in front of EVERYONE. Our friends and family were so fun and creative, we had tons of fun seeing everyone do a fun or romantic version kiss, and then having to imitate and act it out as well! Seriously, this was SO cute. Newlyweds should always be prepared for lots of smooching from the official first kiss until the end of the night. If you can incorporate a fun activity that involves your guests, you really spread the love! 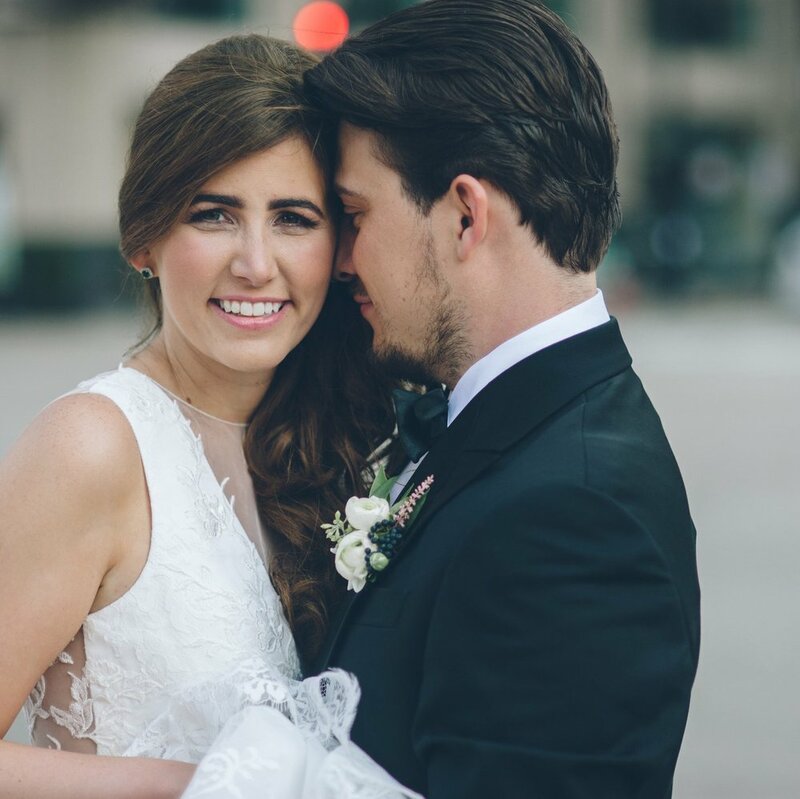 We hope you enjoy these images by Thomas and Erika Photography as much as we do! Make sure to follow us on Instagram for Marcy’s advice to future brides. She provides some really thoughtful and wise guidance!